For some reason, this week Luna is coming to see me very often, at least twice a day! I'm usually sleeping in my nest. Then I can smell Luna's scent and I wake up. She's always there in front of my wooden home's door, sitting on Papa's hand. Then I come out from my nest very awake, but she's not there anymore and Papa takes me in his hand. He then puts some oily thing in the bump under my tail and he leaves me in the floor so I can look for Luna. Usually I find Oscar's cage and try to call him, but he doesn't usually come out when the lights are on. I got angry with Papa when he started putting this new medicine under my tail. It hurt. 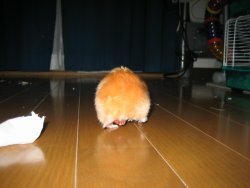 Now it doesn't hurt anymore, but it is still a bit uncomfortable when I walk. That's not a big problem because I have gotten used to it and now I can play and run like usual. Yesterday I was playing in the floor for almost one hour and I fought the evil curtains again. Papa put me back in my cage after a while, but I wanted to play more. I climbed the wire wall in my cage to let him know that I wanted to play more and he got the message. I have trained him well! When I got tired Papa put me back in my cage. I drank some milk and then I went back to sleep. Sweet Nana, you're so strong and brave! Yes, take it out on the evil curtains!! Papa only wants to help you. I bet you've learned to walk so the bump doesn't touch the floor and get sore again. I love your furry orange bummy. Please keep getting better! Nana, the annoying bump will go away in no time because you are so strong that you can fight it off!! if my hamster hurts itself it sits in its nest sulking in self pity. its stupid cos it keeps falling of the top level. Please get better, Nana. We love you! The new medicine will make you better. Please stay strongand get better soon! We are so sorry to hear about your bump, Nana. We know it must hurt a lot, but we're glad you're letting Papa take care of it. Heal quickly!